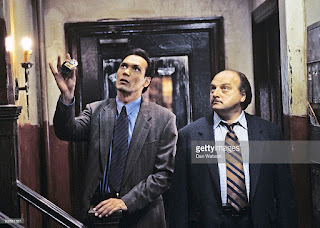 The show didn’t receive a lot of press during this year (I remember a tepid review in Entertainment Weekly and little else), until Jimmy Smits announced in April 1998 that he was leaving the series. Smits’ departure brought to an end a pretty long run of a solid, consistent cast from episode to episode. This is the year Bobby marries his longtime girlfriend (in TV terms) Diane Russell, even though we have to wait until the final moments of the season finale. Until then, he deals with Diane’s pregnancy and subsequent miscarriage, acts as a sounding board for a few characters, and just keeps on working cases until his contract runs out. We do learn some information about his past this year; in fact, the episode “Prostrate before the Law” almost tells us more about his backstory than we’ve learned in the past four years combined. Bobby is the son of a French father and Portuguese mother, he served in the Army Reserve (or at least that’s what he tells a suspect), and he lived in Belize until he was three years old. It’s amusing that the character’s been on the show for so many years, and is about to exit the series, and we still know so little about his past. 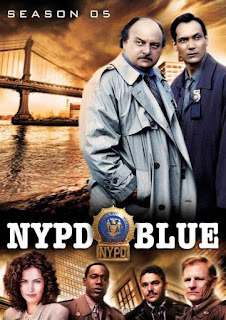 Milch has already established his interest in working out Biblical themes through the show, and it’s clear that Dennis Franz can handle heavy drama, which leads to one of the standard beats of the series -- Sipowicz as Job. This year his big drama is his doctor’s discovery of prostate cancer, which gives us the series’ second “Sipowicz vs. His Prostate” storyline, and more excuses for Dennis Franz to say “prostrate” instead of “prostate.” That one annoyed me, since Upstairs John had already corrected his use of the word, even pulling out the dictionary to make his point, in a previous episode. When doing early press for this season, Milch revealed that Lt. Fancy would be undergoing a midlife crisis this year and likely having an affair. Never happened. Instead, James McDaniel continues to play utility, with only a brief conversation with an old friend that hints that maybe Fancy’s reevaluating some things in his life. The only real attempt at a Fancy-specific episode this year is “Weaver of Hate,” which portrays Fancy as shockingly out of character. 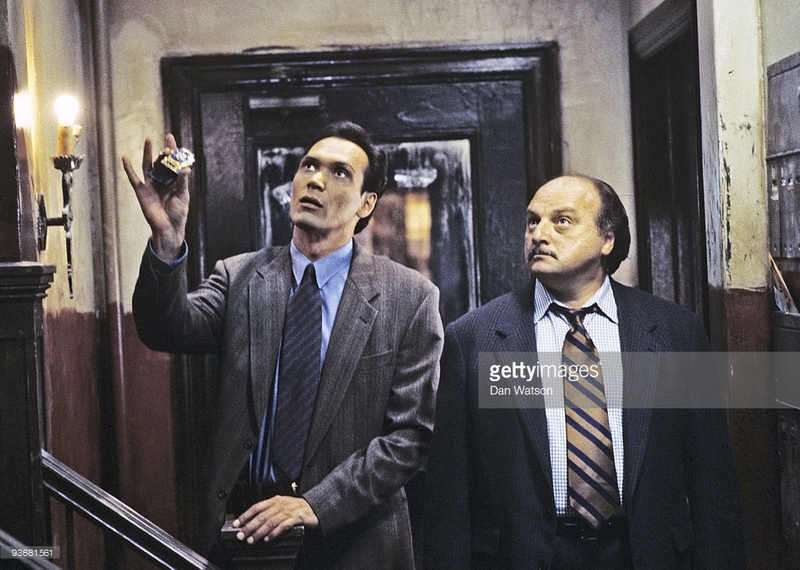 In this episode, Fancy becomes enraged after he overhears a grieving father use racial slurs in the coffee room, leading to a series of irrational decisions that hinder Simone and Sipowicz’s ability to work the case. It’s one of the worst examples of the writers just grasping for something to do with an underused character. 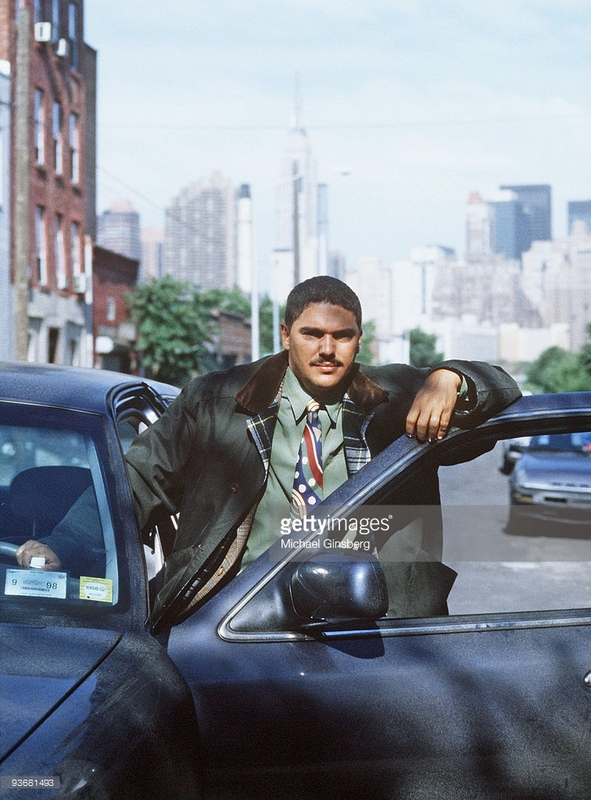 Nicholas Turturro disappears for around a third of the season this year, taking a leave to star as Sammy “the Bull” Gravano in a TV miniseries. 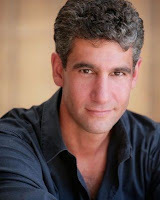 His character does have a few significant moments this season -- he marries Gina the PAA and they have a kid together. How was Martinez written out for a few episodes? He throws out his back during a “domestic situation” with his pregnant wife. Medavoy also becomes a father this season, even though 1) the event occurs off-screen and 2) I don’t think the kid is ever referenced again. The producers put one last try early this year into selling that “Medavoy fathers a lesbian couple’s child” story, but it’s essentially dropped after the first few episodes. Medavoy has a few phone conversations with Abby (who totally disappears from the show), then informs us that the baby’s been born in-between episodes, and that’s it. One important Medavoy story we should’ve seen this year is his reaction to killing someone for the first time. It’s not a controversial shooting, and the character doesn’t have any real options in the situation, but it’s shocking that this moment wasn’t played for some drama. All we get out of it is Diane leaving Greg a message on the phone, offering her support, and that’s all. Medavoy’s back to his normal irritating behavior next episode, with no angst or self-reflection whatsoever. Diane’s storylines are intertwined with Bobby’s, which isn’t surprising since they’re one of the two main romantic couples of the series. (And with Sharon Lawrence only appearing as an occasional guest star, that leaves Bobby/Diane as the only real couple we see on a regular basis.) We also see Diane Russell and Jill Kirkendall grow closer during the year, which is a nice use of both characters. There’s no drama there; they’re just friends who support each other and share small insights into their personal lives. 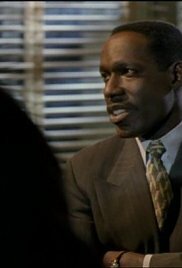 Now officially a series regular, Det. Jill Kirkendall rarely makes a major contribution to the “A” storylines, but she’s always around to play utility and work the B-plots and C-plots. Andrea Thompson, I have to say, is very believable as a cop. She’s much less glamorous than many of the female detectives that are introduced later on, and she has that deep smoker’s voice that just sounds the way I’d expect a cop to sound. Leo Cohen remains the ADA viewers see on a regular basis on the show. This is the year Cohen is portrayed less as a jerk, and more of a guy just doing his job that Sipowicz simply views as a jerk. He’s also given a romantic subplot with Det. Jill Kirkendall in the early episodes that’s casually dismissed by the end of the year (but it does return later). I have no idea what happened here. When the season opens, Gina is clearly pregnant, but still trying to hide the bump and rebuffing Martinez’s marriage proposals. A few episodes in, she relents, they elope, and then…Gina’s gone. Never appears again (well, looking online, it seems maybe she reappeared during Martinez’s final season. Maybe.) Doesn’t give birth onscreen. Doesn’t come by the squad room with the baby. She’s just referred to as Martinez’s wife on a few occasions and that’s all. I have no clue what happened, but giving Martinez a wife that we never see harms his character the same way Sylvia disappearing hampered Sipowicz’s role. Another odd one. Naomi is Gina’s replacement as the squad’s civilian aide (PAA). She has a thick Southern accent that Bobby discovers is actually a cover for her natural Australian drawl. Naomi’s illegally in the US, but dreams of becoming a New York police officer. 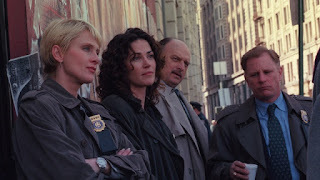 She disappears for several episodes, after establishing a connection with Bobby, then returns in uniform to announce to the new PAA that everything’s worked out okay and to please say hello to Bobby. And…that’s it for Naomi. then six episodes later is back as the new PAA Dolores Mayo. Dolores is another example of the producers using the PAA role as a source of easy jokes; Dolores is initially a bit of a ditz, far more interested in her smoke breaks than in doing work. A few episodes in, she’s not as lazy, but still a bit quirky. Jill learns that Dolores is a ballet dancer who’s insecure in her abilities, a character trait that goes nowhere. I barely remembered this character until I recently rewatched the series, but one thing does stand out -- Lola Glaudini has the kind of face you’d expect to see on a 1920s silent film star. I don’t necessarily find her as beautiful as the characters seem to (most likely due to the way she’s styled on the show; she looks quite different if you Google her red carpet photos), but you can’t deny the woman has a unique face. Det. Morrissey is a minor character who occasionally pops up; I think every time he appears in a story, he’s stymied on a case and has to ask Simone and Sipowicz to help him out. I mention Det. Morrissey because he also has a cameo appearance on Brooklyn South, which establishes the two shows as co-existing in the same world. (How that could be when established Blue actors like Michael DeLuise and Titus Welliver play totally different characters on South is a question that’s never addressed.) 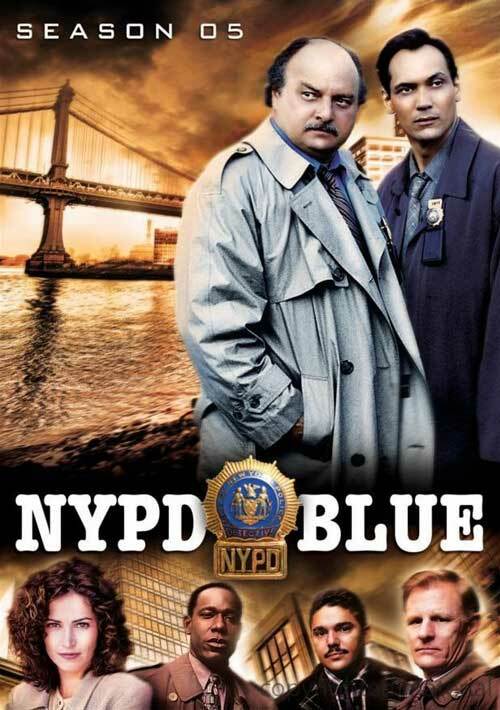 FBI Agent Kriegel, played by Scott Jaeck, is another character from Blue who hopped over to Brooklyn South. Perhaps the most famous example of the show recycling an actor. Charlotte Ross appears in two episodes this year as Laurie Richardson, the abused wife of a uniform cop suspected in a murder. The actress then joins the cast three years later as Detective Connie McDowell. Initially, Ross was there to play the role of secondary female detective on the show, but she made such an impression her role was elevated to that of…well, she became quite an important character. I’ll say that much. And, under mysterious circumstances that had more than a hint of “Caruso” to them, she abruptly disappeared from the series. "Smits’ departure brought to an end a pretty long run of a solid, consistent cast from episode to episode." Also, as per her wiki page, this is Lola Glaudini's third role on the show. The cast is never as stable as it was during Seasons 2-4, expect for maybe the final two seasons. Season Six sees one character go from regular to recurring, while another goes from recurring to regular...plus, Smits is replaced, of course. After the fairly brief Rick Schroeder era, Mark-Paul Gosselaar manages to stick around for four years. Lola Glaudini has shown up fairly often over the years, but I think I missed her on Agents of SHIELD. 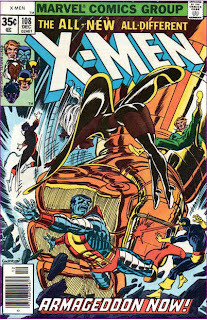 According to Wiki, she also attended Chris Claremont's Alma mater, Bard College.